After some time with iPhone (iOS) and HTC (Android), Dave Lindsay entered the third ecosystem on a Nokia Lumia 820 with Microsoft Windows Phone 8 and found the experience intriguing. He received a sales package that combines premium hardware (Nokia at its best) with a promising OS (with some room for improvement). After some comprehensive testing, these are his feelings.. I studied Business Studies at The University of Huddersfield until 2004 and worked in various organisations including the NHS in IT based roles. I went through a lot of mobile phones as the development at that time was booming. I have had handsets from all the major manufacturers and have used most of the mobile OS out there including Palm, Symbian, Windows Pocket PC/Windows Mobile, iOS and Android. The Nokia Lumia 820 is my first experience of using Windows Phone as my daily handset. How does it stack up against the MUCH more expensive iPhone 5 and the variety of Android handsets I’ve used? 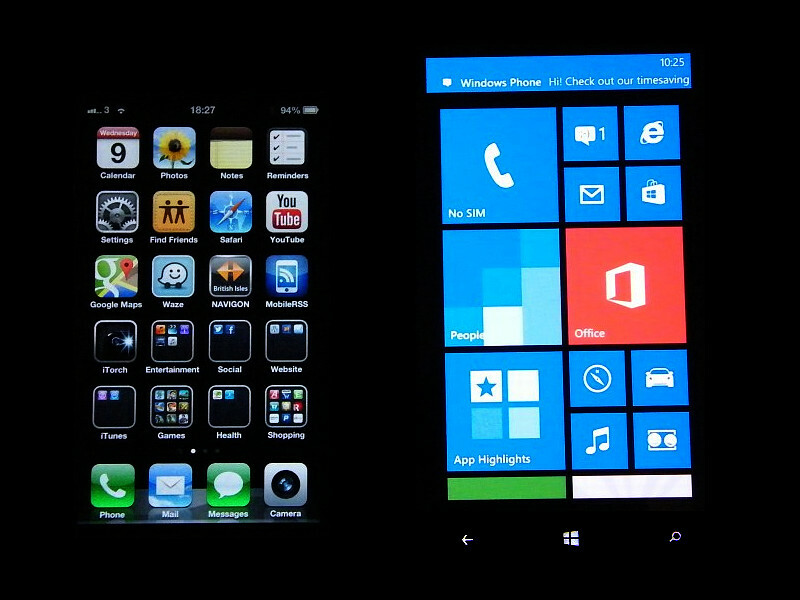 Side by side with the iPhone 5, The Lumia is of similar length, is slightly wider and slightly thicker. The handset does feel heavier but you get used to this and it does feel very well built. The Lumia weighs in at 173 grams on my scales where as the iphone 5 weighs only 118 grams. 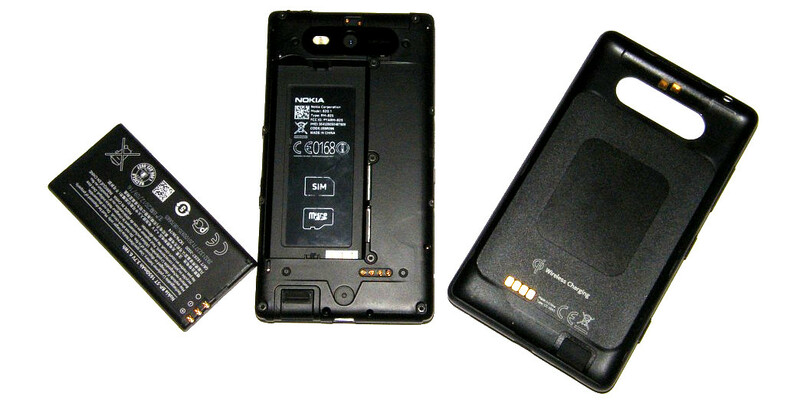 The handset is made form a polycarbonate back shell which is removable to reveal the sim slot, micro SD expansion slot (rare on windows phone) and the swappable battery. This construction on other handsets would feel flimsy but not with the Nokia. The back is a little hard to remove but becomes easier as you get used to the technique and when in place it feels as solid as any phone out there with a fixed battery. This is one of my favourite features of this handset and I wish other manufacturers would adopt this. The SD expansion is very handy as the handset only has 8GB on board storage but the ability to add a 32GB micro SD card gives the handset plenty of room for your music, apps and games. Additional back panels are available in a range of colours to transform the handset to suit your style. This really appeals to me as I insist on using a case with any phone as the slightest scratch will annoy me. With the nokia, if you drop the handset and damage the polycarbonate body then a replacement is easy to fit and has the phone looking like new in no time. Along the right hand side of the device there is the volume rocker, power button and dedicated camera button. The inclusion of a camera button is a nice change as the iPhone and Android handsets that I’m used to do not have this feature (although the iPhone can use the volume key as a shutter button). Pressing and holding the camera button for a few seconds quickly launches into the camera interface even from if the handset is turned off. The location of the power button is the only thing that annoyed me with the build of this phone. 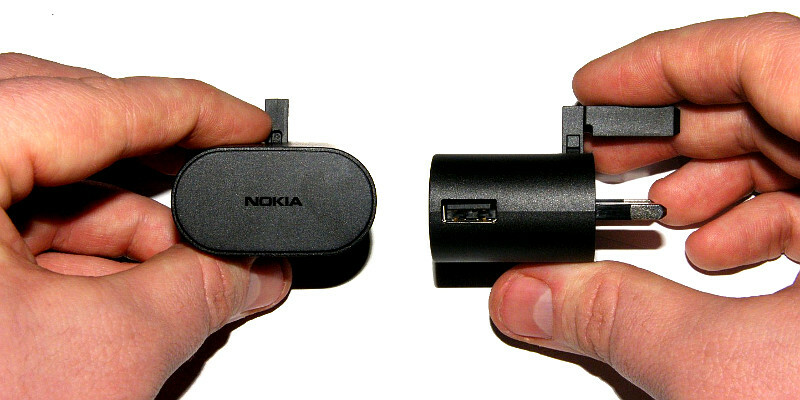 Many people will like to use the included free navigation, Nokia drive, in their car. The location of the power button means that if you use a universal car mount to hold the phone then chances are you will cover the power button and be unable to operate this button while docked. As the phone is quite small and easily held in one hand I think a top mounted power button would have been better here. The speaker on the bottom of the handset is loud! Although it may not have all the clarity of the iPhone 5 loud speaker it does beat it in the volume stakes. The Lumia 820 is the baby brother to the Lumia 920 but it doesn’t feel second best in my opinion. 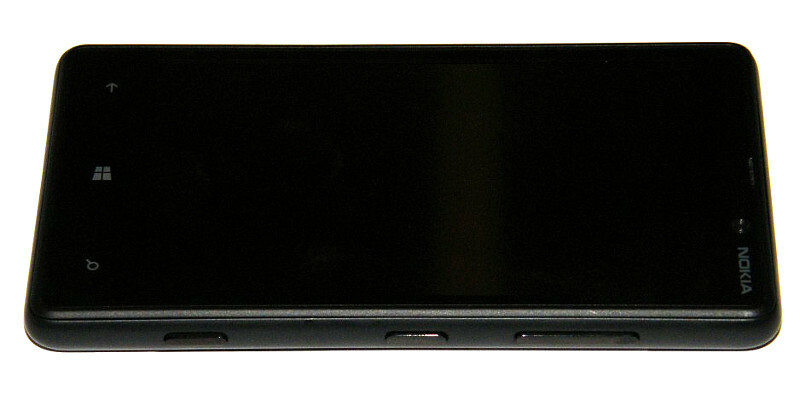 The Lumia 820 offers Windows Phone 8 on its 4.3 inch, 480 x 800 resolution display which looks gorgeous. The blacks are very black and the colours pop from the screen. The resolution is fairly mediocre when compared to other handsets out there including the Lumia 920′s 4.5 inch, 768 x 1,280 screen and the iPhone 5′s 4 inch 1,136 x 640 pixel resolution at 326 ppi, but this isnt a problem when you start using the handset. Even knowing the specs, the handset does not look, feel or perform like an average handset but rather gives the impression of a quality piece of hardware. 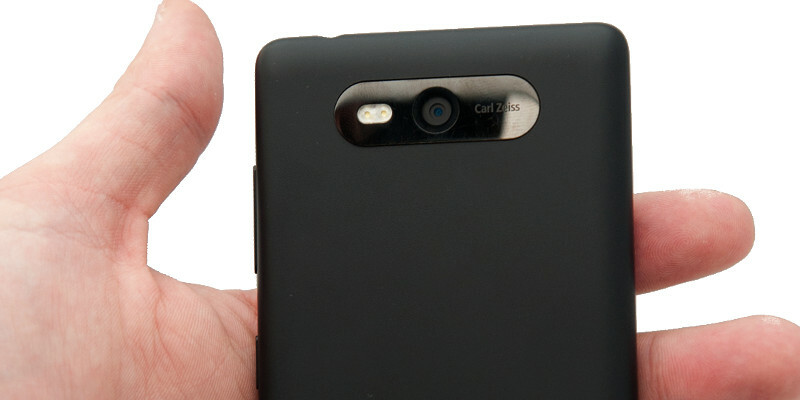 The Lumia 820 features a standard 8mp camera without the pureview tech seen on its big brother but does still have the Carl Zeiss optics. It did perform OK but I wouldn’t say it is the best smartphone camera out there by a long shot. It features a dual LED flash which performs fairly well along with an auto focus lens. In my tests I found the focussing to be a little slow but results were good. When compared to the iPhone 5′s 8mp camera in low light and normal conditions I would say the iPhone 5 topped the Lumia but only just and the Lumia does offer many more options in the camera app. When you take into account the gulf in price between the two handsets then the Lumia is a very good option. The 1.5GHz dual core Snapdragon processor, Adreno 225 graphics chip and 1GB of RAM make sure windows phone 8 loads quickly and smoothly and I experienced very little lag if any and a very fluid experience. Other specifications include dual-band 802.11n Wi-Fi and Bluetooth 3.1, with NFC and LTE network capability. The swappable 1650 mAh lasted a day without issue in my tests although low signal and heavy use does make the battery die MUCH quicker. I did test the handset in a very low signal area where my iPhone 5 struggles to get any usable signal at all and was impressed to see that the Lumia was able to hold onto a usable HSDPA signal. During this time I was setting the handset up from fresh out of the box and managed to run the battery from 90% full to dead in an hour and a half. This is an extreme case and should not detract from the Nokia as the iPhone was not able to get any usable signal at all. The handset also includes Qi wireless charging capabilities which I would like to see on all high end smartphones in the future. Although I was unable to test this due to not having the optional wireless charging base, I have been longing for this feature for the past few years at least. Boxed with the handset are the usual Micro USB sync / charge cable, USB wall charger and wired headset. They are of good quality and with the headset being of the in ear type and the wall charger having an innovative design to save space in the box. As I mentioned above, this is my first encounter with Windows Phone in a “live” situation and at first glance it is a very nice option. The home screen tiles are a nice change from the iPhone’s grid system and are a more user friendly interface than Android. I use my mum as the litmus test for User interfaces and where I would give my mum a windows phone handset and feel she would learn to use it quickly, the same cannot be said for Android. The Nokia apps included in the Lumia range do add value which is a nice change from the bloatware included on network and manufacturer branded Android phones where much of the time the added software just get in the way, waste resources and duplicate features already on the platform. Windows phone does integrate with the windows desktop OS and also xbox but I am a PlayStation user so haven’t been able to try this out and I prefer to use handsets separate to my desktop/laptop. The text input is achieved with the on screen keyboard and while it took much getting used to when moving from the iPhone, I would say it is a solid implemetation and very usable. The Windows phone store is well laid out and growing all the time although some major apps are not available yet such as dropbox. This may be due to the inclusion of Microsoft’s own sky drive but I do not know anyone that uses this option. 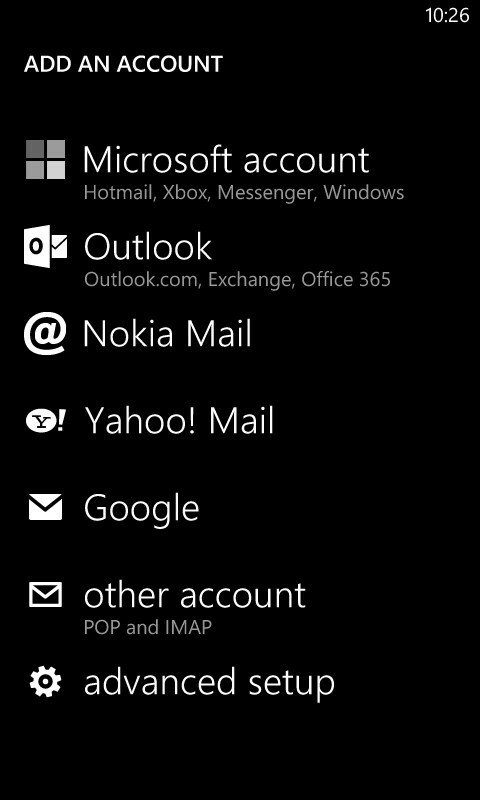 One annoyance of the Windows phone OS is that there is no quick way to enable bluetooth, wifi or airplane mode. On Android you can add widgets to do this from the home screen, on iOS you have to go into settings but the options are at the top. Windows phone requires you to go into system settings like the iPhone but there doesnt seem to be any logic to the layout once youre in there. It is not alphabetical and it is not ordered by priority in order of most used in my experience. On a day to day basis I do not change my ringtone or theme, setup additional email accounts or alter my lock screen options more than switching wifi, bluetooth or flight mode on or off. The disorder of the layout of the settings is infuriating and I found myself scrolling up and down trying to find the most basic of functionality. Unfortunately the feature that meant that Windows Phone could not be a daily handset for me was its ability to integrate with Google services. Initially the set-up of my Google account was easy and contacts and mail synced very quickly but then I noticed that only my main calendar was there. After hours of searching for options it seems as Google have pulled the plug on the Exchange method of syncing in preference to open standards of caldav and carddav. These standards are supported on the iPhone and Android so syncing is quick and easy but on Windows phone there is no such support. I have 5 Calendars synced to all my devices and used every day to plan my time and as Windows Phone has no easy/possible way of achieving this then I’m sad to say it isn’t for me. For many people out there this will not be an issue and I would say that windows phone is affordable and very nice but anyone locked into Google services or Apple’s icloud services will need to work out how possible it is to move to Windows phone. If Microsoft were willing to add the caldav and carddav functionality to their offering then Windows Phone would be a strong contender as there is very little I couldn’t do on the handset that I can do on the competition’s offerings. The lack of this functionality for me meant that Windows Phone wasn’t able to be given the chance to win me over although if it was able to support these standards then I’m sure that I would be hard pressed to fault this handset itself. Windows Phone OS is now a few years old and still needs to mature compared to iOS and Android and the basic issues I found with only fairly limited use does make me wonder why no one at Microsoft seems to have spotted this. The build quality is spectacular and it doesn’t feel like a lower spec device when sat side by side with Apple’s latest iPhone. The inclusion of Qi wireless charging, NFC and expandable memory make the iPhone feel old fashioned but until the OS is improved with support for open standards and the Store has more apps then I cannot make the final switch. I must point out that the handset was compared to the high end competition and in terms of hardware it faired really well given the massive price difference. The OS needs work and, although users would get used to it, a few simple tweaks here and there would greatly improve day to day usage.